LEARNING FROM EACH OTHER. Incoming grade 4 student Lemuel Ian Cua of Culianan Learning Center helps his classmate solve a mathematical problem on fractions. The Culianan Learning Center has been implementing the electronically enhanced Instructional Management by Parents, Community and Teachers (e-IMPACT) system – a revolutionary, non- traditional, and flexible learning program supported by USAID’s Education Quality and Access for Learning and Livelihood Skills (EQuALLS2) project that trains students to become peer group leaders while teachers facilitate a class of more than 80 students ranging from grades one to six. A MIX OF EVERYONE. Tom Crehan, Chief of the Office of Education, USAID/Philippines talks to incoming grade six students in Maasin Learning Center. With him is Edsel Francisco, the school principal. In the background, a teacher oversees a peer group leader practice a reading exercise for grade one pupils. The electronically enhanced Instructional Management by Parents, Community and Teachers (e-IMPACT) system allows one teacher to handle 80 to 100 students clustered according to grade levels in one classroom. EAGER LEARNERS. Elementary students of Maasin Learning Center in Zamboanga City take advance lessons on math to prepare for their role as peer group leaders in the coming school year. An in-service training on math was given to their teachers this summer by USAID ‘s Education Quality and Access for Learning and Livelihood Skills (EQuALLS2) project to help them develop the higher order thinking skills of students in concepts such as fractions, geometry, whole numbers, and pictograph. ZAMBOANGA CITY - Incoming Grade 4 pupil Joshua Bue and some of his schoolmates go to school even on summer to take math lessons from their newly trained teachers. When Joshua returns to school in June he will assume the role of a peer teacher. Last April, teachers from the Maasin Learning Center, a public elementary school tucked within canning plants and other industrial plants in this city, had an intensive training on math to help them develop the higher order thinking skills of students on basic concepts such as fractions, geometry, pictograph, and money. Passing on new strategies to students like Joshua is crucial in a non-traditional school like Maasin Learning Center where students learn while they teach and teachers act as instructional managers. Maasin Learning Center is one of two schools in Zamboanga City that operates under the electronically Enhanced Instructional Management by Parents, Community and Teachers (e-IMPACT) system – a revolutionary, non- traditional, and flexible learning program supported by USAID’s Education Quality and Access for Learning and Livelihood Skills (EQuALLS2) Project. In this set-up, the teacher, known as the instructional manager, facilitates the class and gives advance lessons to students who teach their peers. e-IMPACT was designed by the Southeast Asian Ministers of Education Organization Regional Center for Education Innovation and Technology (SEAMEO INNOTECH) and adapted in the late 70’s by the Department of Education (DepEd) to help deal with insufficient classrooms and to taper off the incidence of drop-outs in public elementary schools. But budget limitations forced the DepED to suspend the program’s implementation in the early 1980’s, with only one of the three pilot schools—the Culianan Learning Center in Zamboanga City— continuing to execute the project. In the opposite side of Zamboanga City, away from the canning factories and into small fishing villages lies Culianan Learning Center, the e-IMPACT pilot school now fast becoming a resource hub for other schools and organizations wanting to implement the system. In Culianan as in Maasin, there are no specific room assignments per grade level, such that some Grade 1’s share a room with Grade 3 and Grade 6 students especially if they are siblings or they come from the same neighborhood. Believing that education is the process of learning and not merely the acquisition of facts, lessons in a mini-class, composed of up to 15 pupils per grade level, are taught by a peer group leader or program teacher like Joshua and other classmates who take their turns teaching one subject. “We found IMPACT to be very effective in improving our students’ academic performance especially when they go to high school. Our graduates always top their class once they are out there! This inspired us to push through with it even without much government support,” said Josefina Lacastesantos, Culianan’s school principal. She was among the first batch of teachers trained to efficiently handle the multiple mini- classes under the non- traditional set-up. 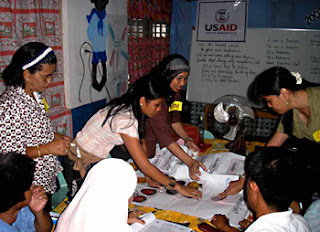 In June 2006 after three decades of toiling on their own, USAID, through its EQuALLS project, assisted Culianan in revising and then reprinting 600 learning modules—equivalent to the traditional school’s textbooks—based on a culture-responsive Revised Basic Education Curriculum. As two of the more than 800 EQuALLS-assisted schools in regions 9, 12 and the Autonomous Region in Muslim Mindanao (ARMM), Culianan and Maasin enjoy the benefit of having continuous teacher and administrator training, intensive on-site mentoring; and advocacy support from EQuALLS. Assistance for the conduct of monthly meetings, contributions for materials for classroom refurbishment, provision of additional books and other learning materials, as well as Math and Science kits were also extended. For the past decades or so, Maasin’s community of multi-cultural groups of Sama, Tausug, Yakan, Badjao, and Christians rarely concerned themselves with school matters. Maasin Learning Center adopted e-IMPACT only last school year. But already it has successfully transformed its physical as well as academic status in the region. It now has ten classrooms that cater to more than 800 students. A two-classroom building was donated by the Filipino-Chinese Chamber of Commerce. “At first, it was quite difficult to explain to the parents why the school needs to adopt the system, but we were quick to let them see the benefits. We have even just completed an in-service training on math this summer which we are now testing on our students,” said the school principal Edsel Francisco. e-IMPACT combines traditional, teacher-based instruction, peer tutoring and self-paced learning as it strengthens the participation of parents and the community in improving quality and access to education. “This is a better experience for me because I learn a lot from my classmates and they also learn from me,” said Lemuel Ian Cua, who was formerly enrolled in a nearby traditional school, but moved to Culianan in the middle of the school year. By passing the periodical tests, he was able to catch up with the lessons and enjoyed being a peer group leader during his afternoon class for the rest of the last school year. e-IMPACT’s focus on self-paced learning allows for the multiple entry and exit of students who are in challenging situations. This virtually eliminates the incidence of student dropout particularly those located within Mindanao’s conflict-affected areas. It allows one teacher, or instructional supervisor to efficiently manage up to 100 students clustered according to grade level under one roof. Drawing from the success of Culianan, EQuALLS chose the first school in the Autonomous Region in Muslim Mindanao, Baas Learning Center in Lamitan town in Basilan island to implement the innovative education system. According to Saudi Daud, Baas instructional coordinator (principal in traditional school), barely six months after adopting the e-IMPACT strategy in June 2006, the number of non-readers and slow-readers has noticeably dwindled from 55 to 20. “e-IMPACT was devised to address the problem on classroom shortage and the high incidence of dropping out especially in economically- deprived areas,” explained Dr Teresa Mukamad, area coordinator for the EQuALLS2 Project. In the case of Lamitan, drop out rates have considerably trimmed down from as high as 20 to zero. It was a welcome development for a community of at least 3,000 predominantly Yakan Muslims, who used to see some of the fiercest fighting between government troops and rebel groups. Overall, Daud said, the new strategy has helped solve classroom and textbook shortage. From having a single textbook for every 20 students, Baas Elementary School now has learning modules for all its 406 students. It was not until late last year that the 30-year-old school produced its first distinction when a student won the provincial level Essay Writing Contest. “Under e-IMPACT, children are more interested to go to school because they are given a chance to actively participate in the learning process. Instructional supervisors told me to prepare the school as we anticipate higher enrollment this coming school year,” Daud said.